Things are getting pretty wacky in the mobile chipset ecosystem. 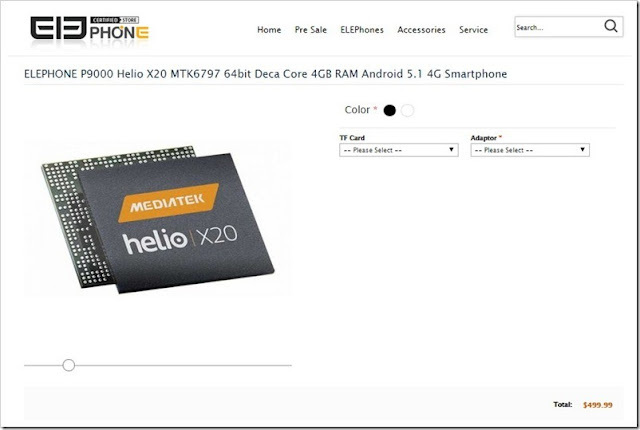 Not so long ago, MediaTek announced the advent of a deca-core silicone piece which would bear the name of Helio X20. This is a 20nm chipset equipped with a pair of ARM Cortex-A72 cores sustaining the heavy duty operations, four ARM Cortex-A53 managing the medium load, while four Cortex-A53 cores will deal with the low-power operations. Apparently, MediaTek is striving for a chip that’s energy efficient and not a benchmark ripping behemoth, although at least on paper, two Cortex-A72 cores seem quite menacing. Anyway, MediaTek is poised to release the Helio X20 sometime in the fourth quarter of 2015, and now a new report coming out of WebCusp reveals that the Elephone P9000 could end up being the first device to take advantage of the 10-core monster. The chipset inside the phone will work in combination with an ARM Mali-T800 series GPU clocked at over 800MHz with 4GB of RAM on board (note that the MT6797 is limited to LPDDR3 RAM, however). The Elephone P9000 will also take advantage of a 5.5-inch 1080p display, 32GB of expandable storage, a 20.7MP main camera (probably made by Sony), a 8MP selfie snapper, and a 3,100 mAh battery under the hood. The source goes on to mention that the phone could go on to make a debut on the market for $500 / €439 a pop. Expect the phone to debut in October with Android 5.1 Lollipop on board.